XL Timing belts have small teeth and are generally found in equipment such as electronic equipment and power tools such as power sanders, woodworking tools & lathes, electric sharpeners, pumps, and robotic equipment where small timing belts are required. "Trapezoidal" is used to describe the squared shape of the tooth profiles. XL belts are sized by Outer Circumference (Overall Length), Pitch Type, and Width. For example, a 10.0” Circumference "XL" belt 3/8” wide would be described “100XL037” in Standard or Imperial units (-"037” would represent 0.375” or 3/8” width). A "G" suffix is occasionally used to further identify Neoprene belts (black rubber) and "U" for Polyurethane material (colored plastic). "UG" would designate Polyurethane with Fiberglas cord backing, if applicable. 50XL037 Synchro Link Timing Belt. 5" Length OC. 3/8" Wide - 1/5" (.200/XL) Pitch. 25 Teeth, 5" Pitch Length. 60XL037 Belt. PREMIUM BANDO USA TIMING BELT. 6” Length OC (152mm). 30 teeth. 3/8" (.375 inch) wide. 1/5” (.200”) Tooth Pitch. Replacement “60-XL Series” Timing Belt. 90XL025 Timing belt. Industrial Grade. 90XL025 HTD Timing Belt. 9.0” Length, 45 teeth, 1/4” Wide. Neoprene HTD 90XL-025 Timing belt 90XL-025. Industrial Grade. 90xl037 Timing Belt: 9" Length, 45 Teeth, 3/8" Wide, XL (.200") Pitch. Replaces: Grainger 1DHH4, Bando 90XL037, JASON 90XL-037, Dayton 1DHH4, Gates 90xl037. Compact Tristar Vacuum Belt C-0011l. GBC 1981303 belt. Synchronous Belt. 98XL037 HTD Timing Belt. 9.8” Length, 49 teeth, 3/8” Wide. Neoprene HTD 98XL-037 Timing belt 98XL-037. Industrial Grade. 100XL056 HTD Timing Belt. 10.0” Length, 50 teeth, 9/16” Wide. Neoprene HTD 100XL-056 Timing belt 100XL-056. Industrial Grade. 104XL037 HTD Timing Belt. 10.4” Length, 52 teeth, 3/8” Wide. Neoprene HTD 104XL-037 Timing belt 104XL-037. Industrial Grade. 106XL025 BANDO Timing Belt. 10.6” Length, 53 teeth, 1/4” Wide. Neoprene HTD 106XL-025 Timing belt 106XL-025. Industrial Grade. 108XL037. 10.8 inch Length. 54 teeth. 3/8” (.375 inch) wide. Replacement “XL Series” Timing Belt. Popular replacement belt for electronic equipment such as power sanders, measuring wheels, water pumps, and robotic equipment. 110XL037U. 11 inch Length, 55 teeth. POLYURETHANE Synchro-Link Timing belt replaces A6R3-055037. 110XL100 Timing Belt (HTD). 11.0” Length, 55 teeth, 1” Wide. Neoprene HTD 110XL-100 Timing belt 110XL-100. Industrial Grade. 116xl037 Timing Belt. 11.6" Length, 58 Teeth, XL (.200") Pitch. Replaces Sears-Craftsman 622827000 belt. 118XL100 Timing Belt (HTD). 12.4” Length, 59 teeth, 1” Wide. Neoprene HTD 118XL-100 Timing belt 118XL-100. Industrial Grade. 124XL037 Timing belt. Industrial Grade. 124XL037 Timing Belt (HTD). 12.4” Length, 62 teeth, 3/8” Wide. Neoprene HTD 124XL-037 Timing belt 124XL-037. Industrial Grade. 128XL037 Timing belt. Industrial Grade. 128XL037 Timing Belt (HTD). 12.8” Length, 64 teeth, 3/8” Wide. Neoprene HTD 128XL-037 Timing belt 128XL-037. Industrial Grade. 132XL031 Timing Belt. 13.2” Length, 66 teeth, 5/16” Wide. Neoprene HTD 132XL-031 Timing belt 132XL-031. Industrial Grade. 136XL037 HTD Timing Belt. 13.6” Length, 68 teeth, 3/8” Wide. Neoprene HTD 136XL-037 Timing belt 136XL-037. Industrial Grade. Polyurethane 140XL037-UG Timing Belt. 14.0” Length, 75 teeth, 3/8” Wide. Polyurethane TBT XL 140XL-037-UG Timing belt 140XL-037-UG. 144XL037 HTD Timing Belt. 14.4” Length, 72 teeth, 3/8” Wide. Neoprene HTD 144XL-037 Timing belt 144XL-037. Industrial Grade. 148XL037 Timing belt. Industrial Grade. 148XL037 HTD Timing Belt. 14.8” Length, 74 teeth, 3/8” Wide. Neoprene HTD 148XL-037 Timing belt 148XL-037. Industrial Grade. 152XL050 HTD Timing Belt. 15.2" Length, 76 teeth, 1/2” Wide. Neoprene HTD 152XL-050 Timing belt 152XL-050. Industrial Grade. 156XL037 HTD Timing Belt. 15.6" Length, 78 teeth, 3/8” Wide. Neoprene HTD 156XL-037 Timing belt 156XL-037. Industrial Grade. 158XL037 Timing Belt (HTD). 15.8” Length, 79 teeth, 3/8” Wide. Neoprene HTD 158XL-037 Timing belt 158XL-037. Industrial Grade. 160XL025 HTD Timing Belt. 16.0” Length, 80 teeth, 1/4” Wide. Neoprene HTD 160XL-025 Timing belt 160XL-025. Consumer Grade. 162XL037 HTD Timing Belt. 16.2" Length, 81 teeth, 3/8” Wide. Neoprene HTD 162XL-037 Timing belt 162XL-037. Industrial Grade. 166XL031 Timing Belt. 16.6” Length, 83 teeth, 5/16” Wide. Neoprene HTD 166XL-031 Timing belt 166XL-031. Consumer Grade. 168XL037 HTD Timing Belt. 16.8" Length, 84 teeth, 3/8” Wide. Neoprene HTD 168XL-037 Timing belt 168XL-037. Industrial Grade. 170XL031 Belt. PREMIUM BANDO USA TIMING BELT. 17” Length OC (432mm). 85 teeth. 5/16” (.31 inch) wide. 1/5” (.200”) Tooth Pitch. Replacement “170-XL Series” Timing Belt. 196XL037 HTD Timing Belt. 19.6" Length, 98 teeth, 3/8” Wide. Neoprene HTD 196XL-037 Timing belt 196XL-037. Industrial Grade. 390XL037 Timing Belt (HTD). 39.0” Length, 195 teeth, 3/8” Wide. Neoprene HTD 390XL-037 Timing belt 390XL-037. Industrial Grade. 412XL037 Timing belt. Industrial Grade. 412XL037 HTD Timing Belt. 41.2” Length, 206 teeth, 3/8” Wide. Neoprene HTD 412XL-037 Timing belt 412XL-037. Industrial Grade. 420XL037 TIMING BELT. 420XL037 TIMING BELT. Replacement timing belt for exercise equipment, office machines, hobby tools, machine tools, postage handling equipment, sewing machines, vending machines and many more. 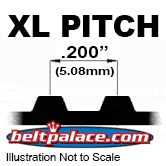 500XL037 HTD Timing Belts: 3/8" Wide - 50" Length. 500XL037 Timing Belts: HTD, 3/8" Wide - 250 Teeth, 50" Pitch Length. • 630xl037U. 630xl037 Urethane timing belt. Steel cord reinforced. 630xl037U. 630xl037 Urethane timing belt. Steel cord reinforced. Limited Stock! Order now! 638XL037 HTD Timing Belt. 63.8” Length, 319 teeth, 3/8” Wide. Neoprene HTD 638XL-037 Timing belt 638XL-037. Industrial Grade. 770XL037 Timing Belt. 385 Teeth, 77" Length. 3/8" Wide. GATES 770XL-050. 77 inch. 385 teeth. Replaces Raymarine part D041, Timing belt A6R3-385050. Neoprene Synchro-Link Timing belt.